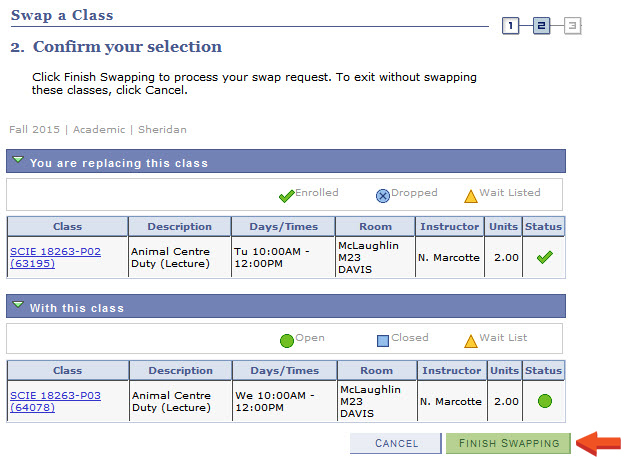 Students who have paid their fees can update their timetable using the Add, Swap, Drop process. Students may add, drop or withdraw from courses they are registered in by the deadlines indicated in the Academic Calendar. Failure to comply with published deadlines may result in a grade of “F or NE”. These values are included in the GPA calculation with a value of zero. To ensure that you have the most current version of your timetable, we recommend that you revisit your timetable on the first day of class. Students can add courses delivered on campuses other than their home campus. Therefore, it is important that students are familiar with the location of all their classes. 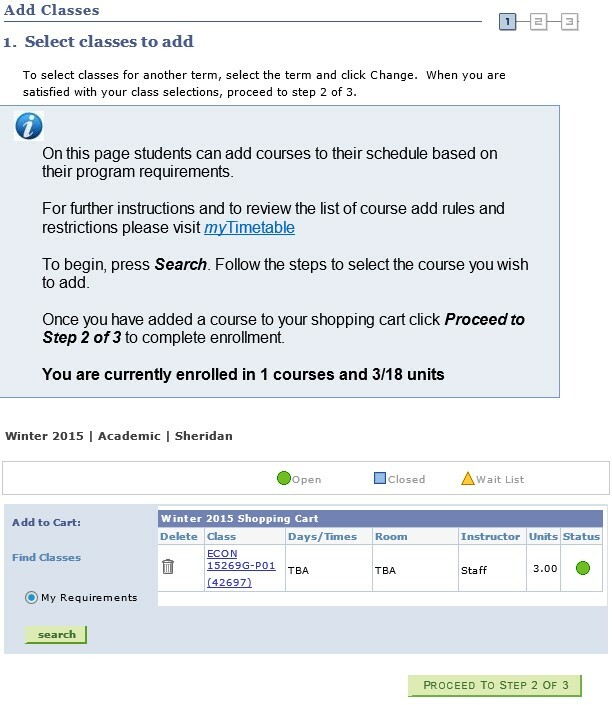 Sheridan offers in-class, online and hybrid courses. 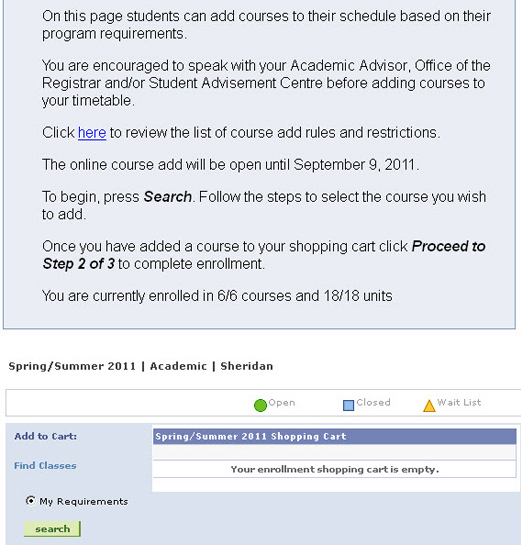 Please ensure that you check the course instruction mode prior to adding or swapping a course. The deadline for Online Course Adds for the Spring/Summer term is Friday, May 10, 2019 for session A* and regular session classes. 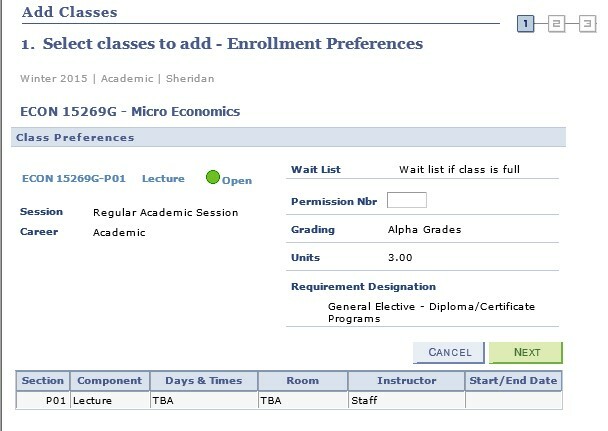 Students are also able to add courses ahead of their normal program progression. However, students are advised to keep to the recommended program path as outlined in myAcademic Requirements. Students cannot add a class if there is a time conflict with another class. Each student is assigned an expected course load based on their current level in their program. 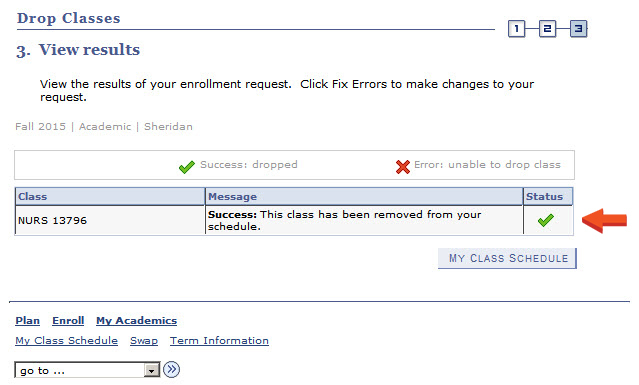 Students are unable to exceed this course load using the online course add functionality. Due to the specialized nature of FAST programs, online add, drop or swap will not be available to FAST students in their first semester. This option will be available for future terms. COSM11254 Fundamentals of Makeup Appl. JOUR27545 Broadcast Mag Show Prep. All full-time, postsecondary students may take courses in the day or evening in addition to their regular curriculum at Sheridan providing they meet course prerequisites and satisfy any co-requisites concurrently. Students may take additional courses beyond their full course load, providing there is space available. Additional fees will apply. Under exceptional circumstances, students may be approved by their Associate Dean to substitute a course within the same term with a course of equal credit value, providing there is a space available and they do not exceed their full course load. The tuition fee will be waived. All other course fees will apply. Students must obtain approval for proposed course replacements or substitutions from the Associate Dean responsible for their program of study. In the case of General Education courses being replaced or substituted, approval by the Cross-College General Education Coordinator is required. Some Continuing Education courses may be exempt from this policy. Students may replace courses for which they have been granted Advanced Standing or Prior Learning Assessment with courses of equal credit value provided space is available. 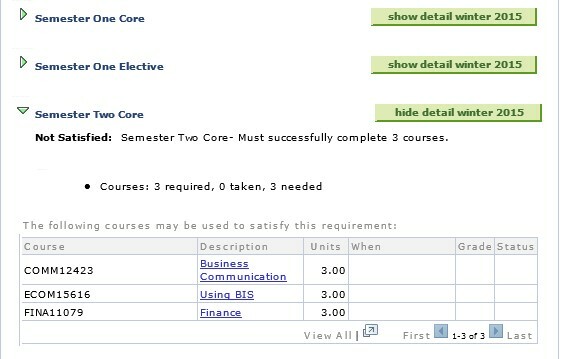 These substitutions must be made within the same term; credit values/courses cannot be transferred to subsequent terms. It is the student’s responsibility to request substitutions for courses where Advanced Standing or Prior Learning Assessment have been granted. Additional fees may apply. The deadline for online course swaps for the Spring/Summer term is Friday, May 10, 2019. Students can swap an assigned class for the same class at a different time or day. 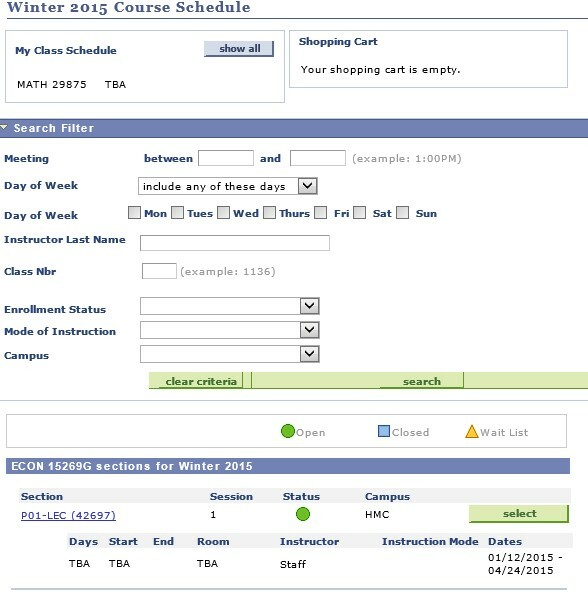 Both full-time and part-time students can swap class times online. Due to the specialized nature of FAST programs, online add, drop or swap will not be available to FAST students in their first semester. This option will be available for future terms. To begin select the class you wish to swap. 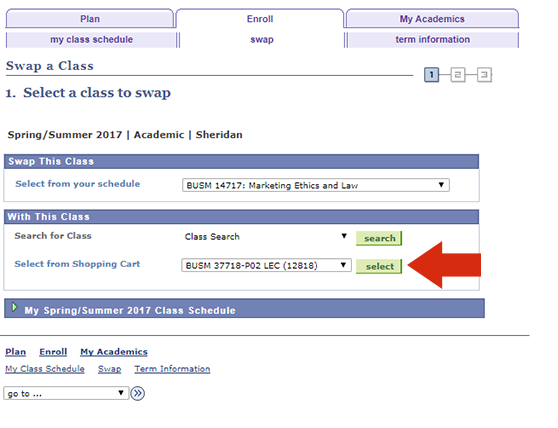 You can swap with a course in your Shopping Cart (see below) or you can search for another course in the course catalogue. 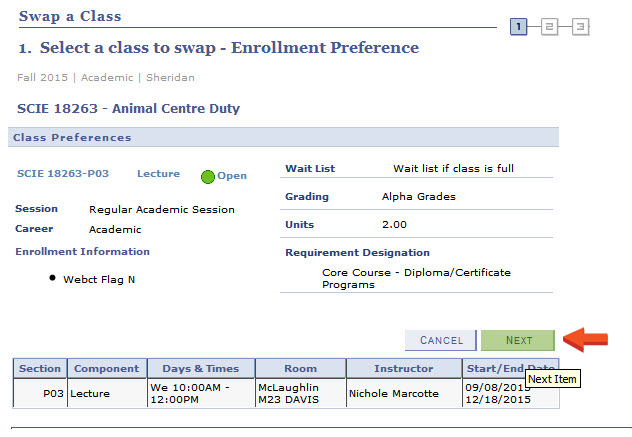 If you are unsure in either situation, please contact your program advisor before swapping a class. 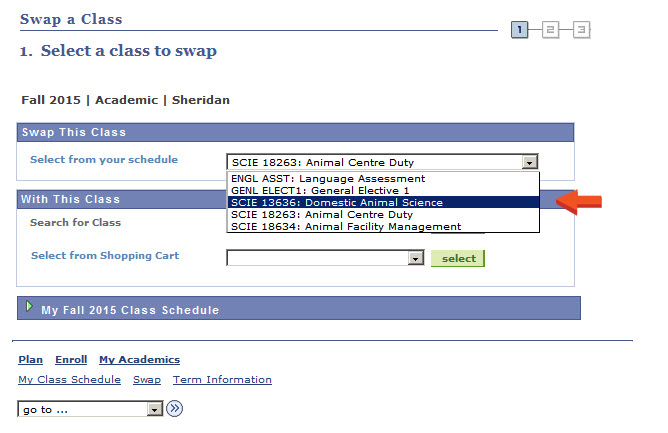 Alternatively you can select the class you wish to swap and click Search to select Sheridan's course catalogue. 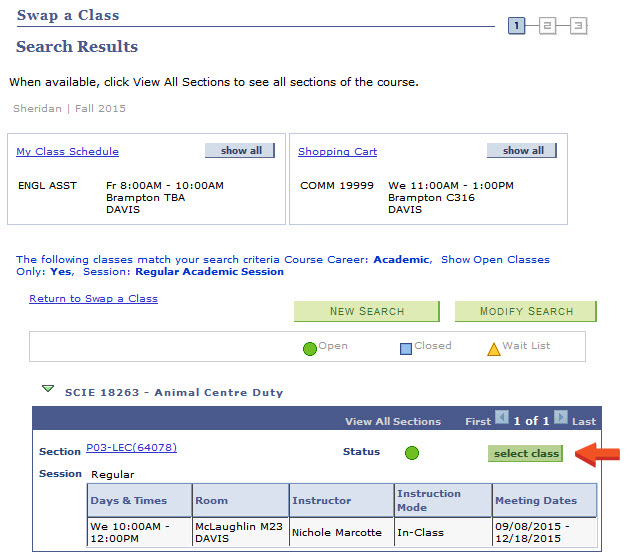 On the next screen click the "Search" button to view a list of classes you can swap to. Please note: the Search will only return classes that currently have available places. Select the class you wish to swap to. 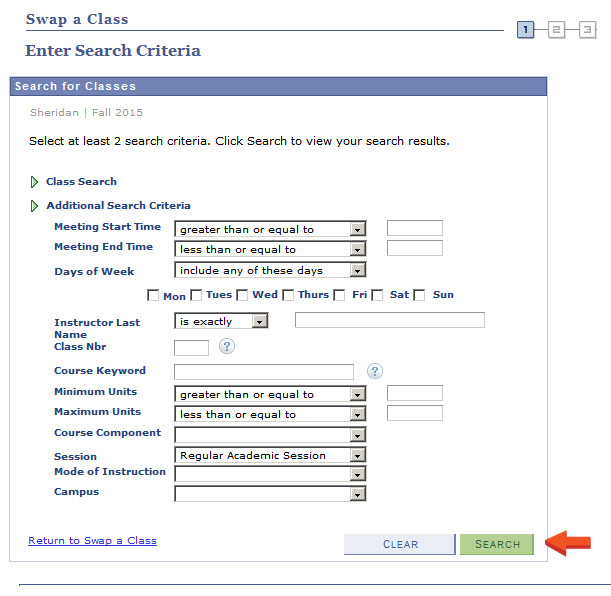 If the search returns no classes you may need to widen your search criteria or no classes with free places are currently available. 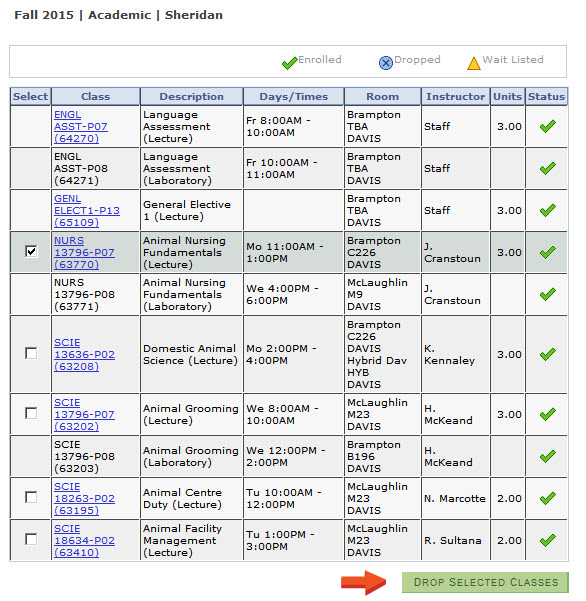 When swapping a class with a lab component you will be prompted on a new screen to select the lecture/lab component that coincides with the class you chose to swap to. Select this component and click Next to continue swapping. 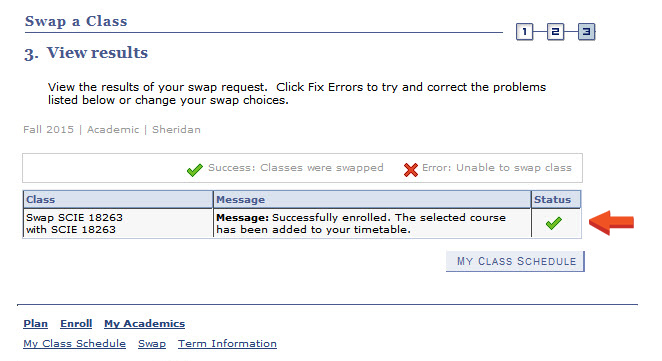 After reviewing the class information, click Finish Swapping to confirm your swap selection. Friday, May 17, 2019 is the last day to drop a session A* or regular session course/withdraw from a program for the Spring/Summer term and be eligible for a partial refund. Do you know when the course will be available again? 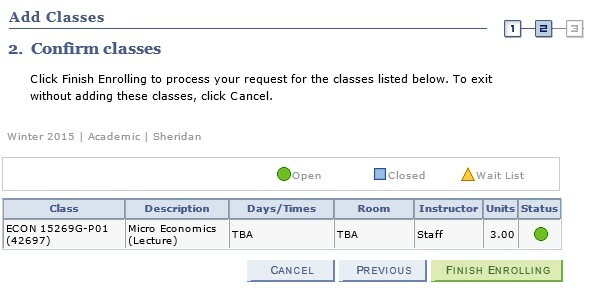 Some courses at Sheridan are only offered during one term of the academic year. It may be necessary to wait a year before you can retake the course. What are your options for retaking the course (e.g. Continuing Education vs. Day School). 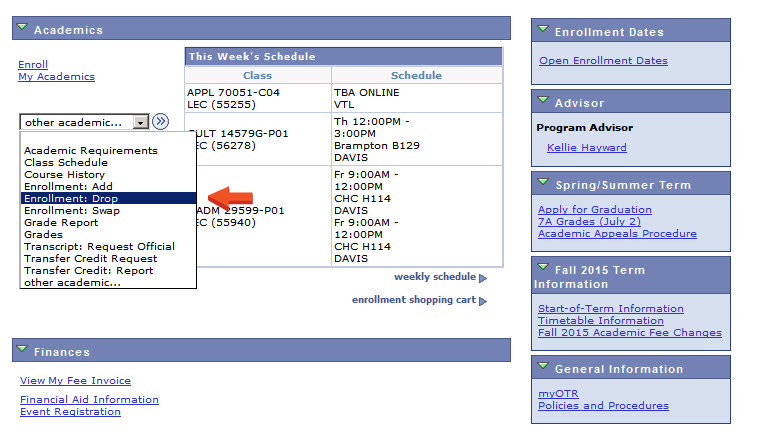 How will dropping a course (particularly pre-requisites) affect you for future courses? How will dropping a course affect your graduation prospects? If you are unsure of the financial or academic consequences of dropping a course you should contact a Academic Advisor, the Office of the Registrar or the Student Advisement Centre. Students will not receive a refund for a dropped course. Students that wish to take a previously dropped course will incur additional costs for doing so. Fees to retake a course are considerably higher for international students. It is recommended that you contact the International Centre to determine the cost of adding the course in a future term before dropping the course. 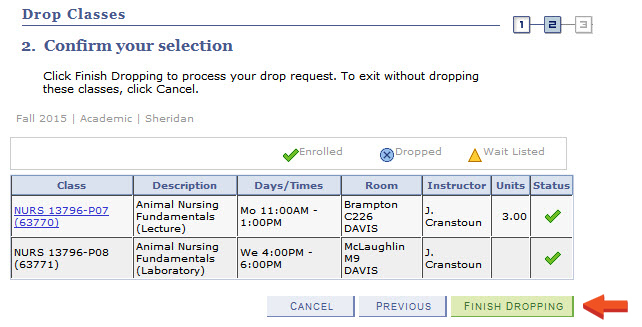 To begin, select the classes you wish to drop and click "Drop Selected Classes". 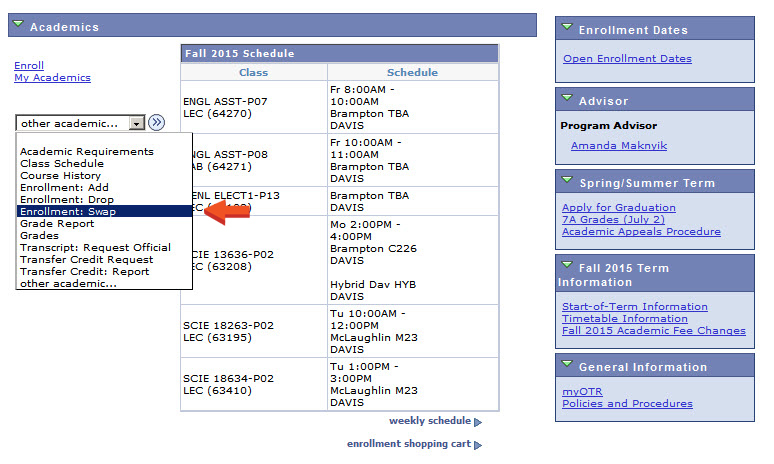 If you are unsure, please contact your program advisor before dropping a class. On the next screen you will be asked to confirm the drop. You will receive confirmation if your Drop has been successful or not.